Remember back in June, we discovered Duke chained to a trailer and left to die? His only food and water was thrown at him by passers-by and his front legs were desperately deformed by sadistic mistreatment. We have been blown away by the love and the support that people have shown him in his long road to recovery. He has been through painful treatment to straighten and strengthen his legs and finally, last week, he boarded the adoption bus to his forever family in the UK. Here is the next leg of his story – please pardon the pun! Take me out, take me out now! At the end of our last blog, Duke had just undergone the first operation to reset the bones in his foreleg. We had to restrict his movements so that he could heal, but that was like telling a toddler to stop running about. It was as if he didn’t know he had just undergone major surgery! The cut on his leg healed well and eventually we were able to take out the stitches – we have become quite good at animal first aid since founding the Shelter – to save him the tiring three and a half hour journey to Provet in Plovdiv. 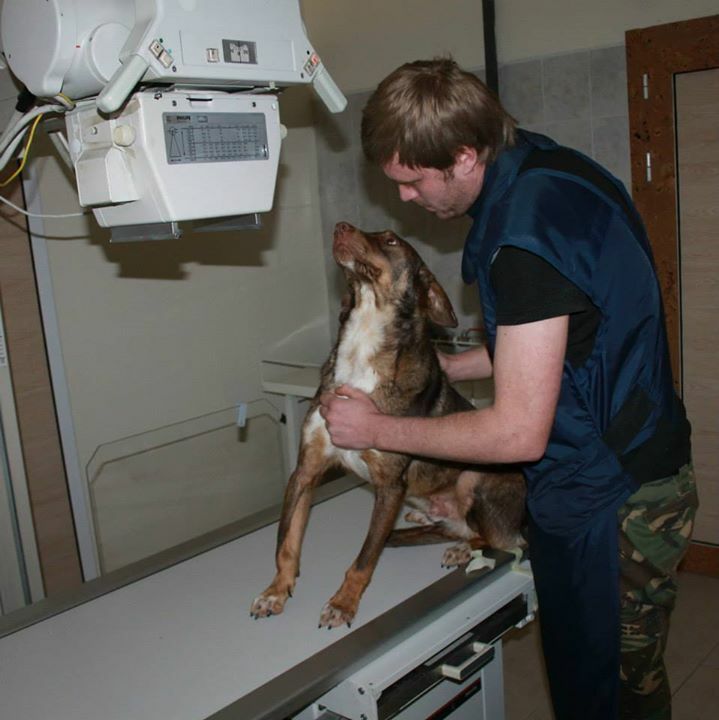 The following month, Duke went back to the vet’s for another check-up and more X-rays. You can see from the photo on the left how he took it all in his stride. And as soon as we got home, he was out in the garden again, playing around with the other dogs. By the middle of October, Duke had progressed so far that we started discussing with the vet what to do next to make sure that Duke would be able to walk again properly. As usual, he charmed everyone at the clinic. We were told that his right leg would still need surgery in the new year to put a plate in his carpel joint, which was still a little loose. This would also help prevent the early onset of osteoarthritis. The good news was that the operation to correct the unnatural movement in his shoulder caused by the damage to his foot had been a great success. Duke, you’re such a flirt! Am I making you feel sorry me yet? The operation on Duke’s left leg was successful. Then, at the end of November, something amazing happened: a lady from the UK applied to adopt Duke! Her name was Diana. 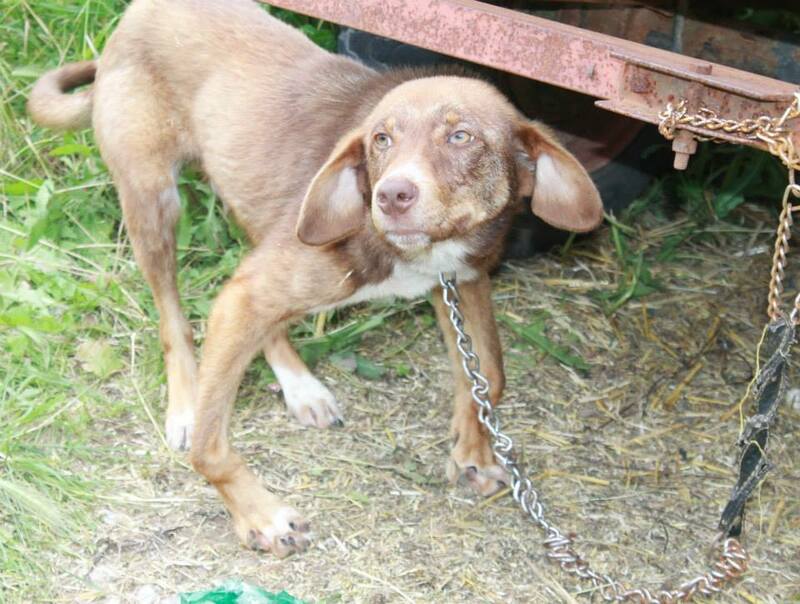 We vet our adopters very thoroughly so one of our UK admin team spoke with Diana at length during a phone interview. She was provisionally approved and then received a visit from a home checker. Everyone thought that she would give Duke a wonderful home. Diana suggested that Duke could finish his treatment in the UK, but said that she also just wanted whatever was in his best interests and that she was prepared to wait for however long it took until he was ready for adoption. It was an opportunity we all thought about and discussed and, after weighing up all the options, we decided it would be better for Duke to stay in familiar surroundings with people he knew well. After all, the vets in Plovdiv had been doing a superb job caring for Duke. 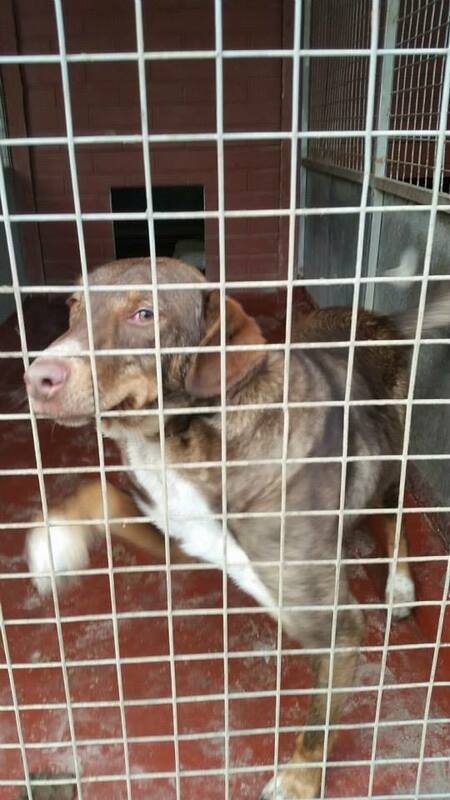 They had been discussing Duke’s case with specialists in Bulgaria and Italy so we thought it best to continue with them until they agreed that he was ready to leave for adoption. And then there was more good news when we went back to Provet in January. After more X-rays to determine the next steps, the vet gave Duke the all-clear! He was so happy with Duke’s progress that he said there was no point in doing any more operations. The chances are that Duke will develop osteoarthritis one day because of the damage he suffered to his feet and carpal bone – if he does, he might then need another operation. 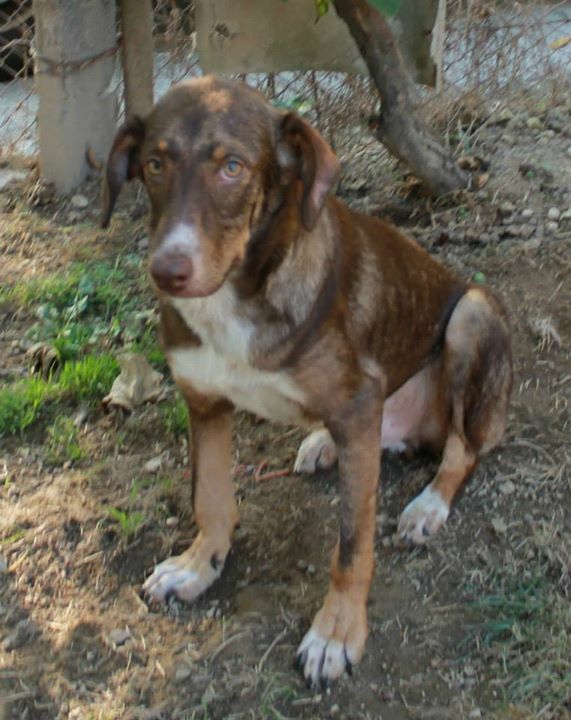 But he was at last ready for adoption and how lucky was he that Diana was waiting for him! Don’t look so sad, boy. You have a lovely life ahead of you. 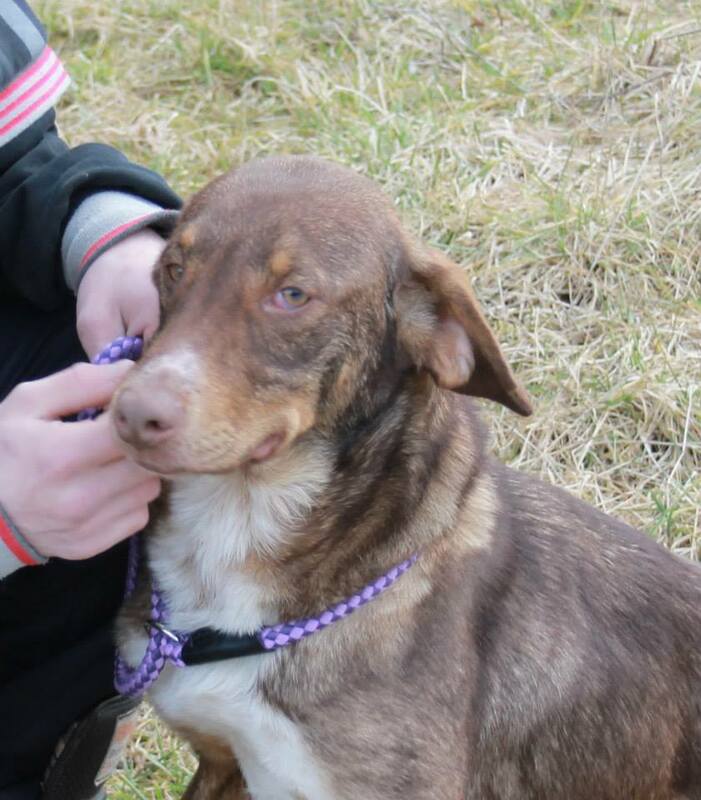 When I saw Duke on the RSDR website, my heart went out to him. 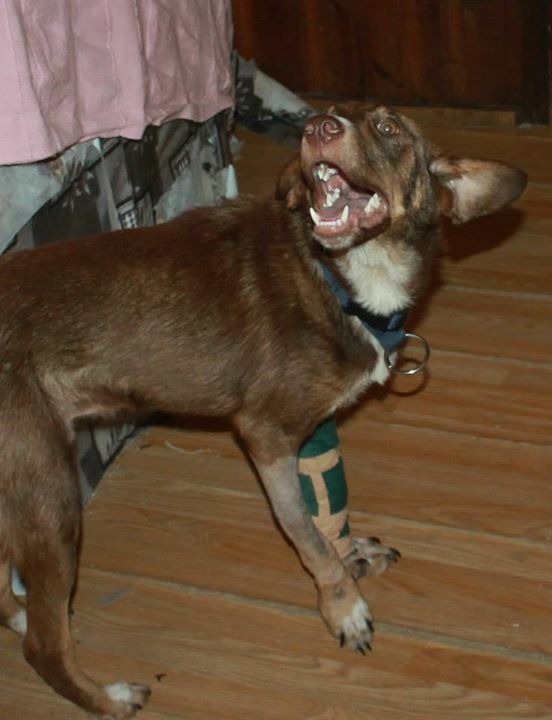 I wondered whether he would have issues with his legs and paws in the future and if anyone else would want to adopt him when there were so many healthy dogs and puppies on the website. I knew I could give him a loving and comfortable home and deal with any health issues so I registered my interest. I’m very happy that he recovered so well in Bulgaria and his future looks much better and brighter health-wise. All the recent photos are wonderful and he looks such a happy and friendly boy – such a difference from the frightened, timid dog Tony rescued. Duke was just as lively in the kennels. And then came the day to say goodbye. Last Friday, we bade him a teary farewell as he got on the adoption bus to the UK. We were absolutely delighted that he was on his way to a fabulous forever family, but given how we found him and what we have all been through together, it was a bitter-sweet parting. The bus trip takes the best part of three days and once the dogs arrive in the UK, under the DEFRA-regulated TRACES procedure, they must all spend 48 hours in kennels to be inspected by an authorised vet. This also gives the dogs the chance to get used to the new sights, sounds and smells of a new country and to catch up on some sleep. The big day finally arrived yesterday when Diana was able to collect Duke from the kennels and take him home to be given a happy life and so much love. She has sent us these photos of him making himself at home. We wish you the best of everything, Duke. You deserve it! Read an update on Duke from July 2016 to see how he’s thriving in his forever home in England. We love you, Duke! Be Good! I will never forget you, my boy! Thanks, Roy. Duke is doing really well in his UK forever home. Good luck Duke the dude! Thanks, Keechy. He is doing really well in his UK forever home. Emma, I am so sorry for the late reply to your message. What a great idea you have had! Well done, you. Anything that helps a rescue dog find their happiness is all right by us. We can only rehome to the UK, Netherlands and Belgium where we have established support networks, but we applaud everything you are doing Stateside. Thank you for your interest in RSDR. Well done to Dianne. I have a Thai street dog that I brought back to UK…9 years now..she too had to learn to walk. She remains so lovable and very loved, as I know Duke will be. I am always amazed at the cruelty suffered by dogs and cats, frequently by their owners. Personally, I consider these people to be monsters, equal to cockroaches. It is not fair to call them animals, for animals would never do the things monstrous people do. I would like to see them locked up for the rest of their lives. Prison is where they belong. Thank you to rudozem for the tireless work you do to help these precious animals. If I lived in Europe, I would love to adopt one of your animals. However, as I am sure you already know, we have so many homeless animals in our area, a suburb of Chicago. Thank you, Bill. He has such a happy life now. Thank you for the great work that you do. I don’t understand how people can harm animals that do nothing but want our love and affection and that will do almost anything to get it. You are good people and you should be proud of what you do. My hat is off to all of you and the people that adopt these brave, lovable animals. What happened to the monsters who did this to him? Someone must know who they are. Yes I agree with the above comment. Those monsters need to be tracked down, reported, given hard labour doing supervised community work, made to present for some ongoing re-education for a long time and fined a lot. They should never be allowed to have a pet again. They should not be allowed to get away with doing what they have done, and most certainly need to be prevented from doing so again. Unfortunately, they are either sadists, mentally impaired by sad circumstances themselves or alcohol/drug addled and impaired. None of which is good. Please follow up and find them before they do worse. Thank you to the woman who found and reported Duke’s situation, perhaps she can help track those responsible. Thank you to everyone who has had the compassion and heart to help little Duke (and those like him). Bravo for your great work. it is much needed. What happened to the quarantine rules putting dogs in shelter for six months before permitting them free reign in England? I believe that if you read the story again you would see that he had been in a shelter location for many months during his treatment and recovery time. 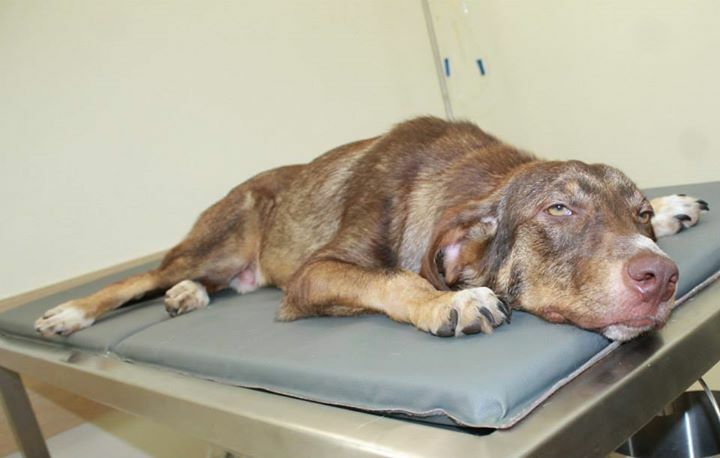 From looking at the pictures regarding the vet services, I would say they knew the risk factor involved with the dog and did not allow him “free reign”. I interpreted that there was also a time factor involved in treatment regarding his age, so absolute quarantine was not an option. I can understand your inquiry, but find it rather disconcerting, but again we are all allowed an opinion. God bless the animals and those who love and care for them!!!!!! They will find reward in Heaven.